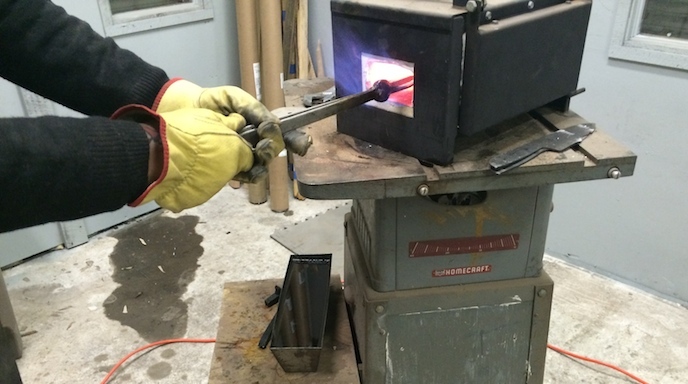 I recently finished a metal class at the Station North Tool Library in Baltimore. 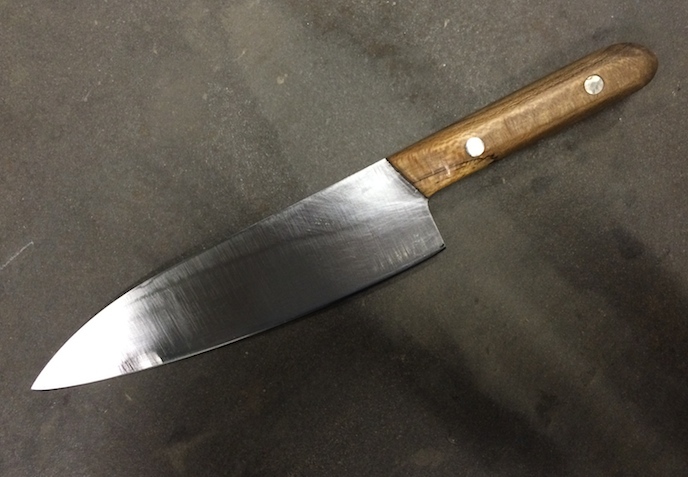 The goal of the class was to form my own chefs knife out of a thin sheet of steel, 2 rivets and 2 thin pieces of wood. 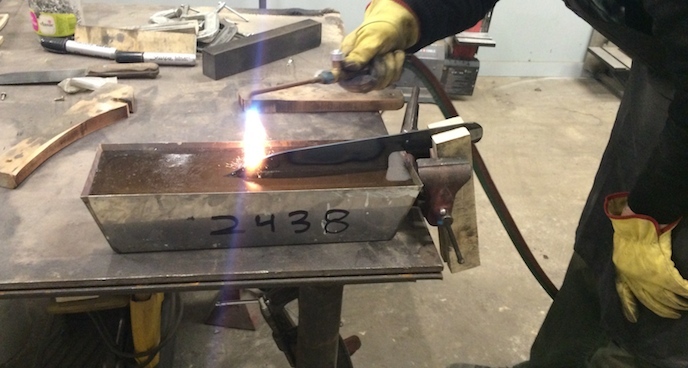 The steel had already been formed so there would be no open flames and hammering for me. However there would be plenty of cutting, filing, drilling and sanding to be done before my knife would reveal itself. 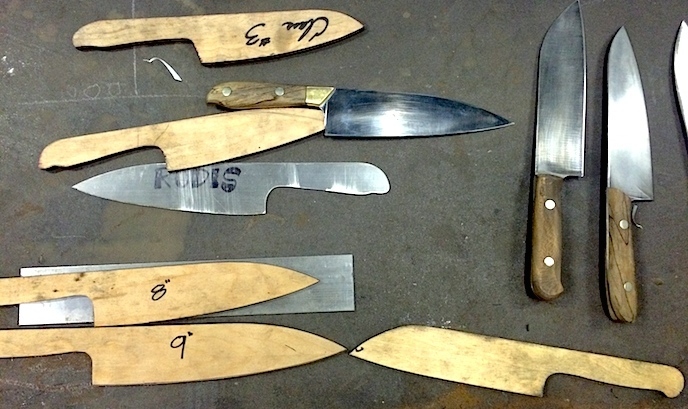 The first step, pictured above, was to pick out the shape and style of my knife using wood patterns. Now it was time to file down all of the sharp edges using a belt sander, making sure to get everything as smooth as possible. After everything was smooth, I clamped the metal cutout to a wood block and began to shave the metal down. This creates a bevel or angle creating a strong spine and the start of a razor sharp edge. After several hundred passes over several grits of sanding belts, I finally reach the right angle. Now it was time to heat treat my steel in a small kiln. This process would change the chemical and physical composition of my knife to create a very strong and flexible spine while keeping the blade edge soft and flexible enough to sharpen into a razor sharp edge. Sometimes the heating process can twist and turn, or even crack your blade if it's not done just right. Luckily for me, we just had to use a torch to heat my blade and straighten it slightly. After the blade is straight, it is cooled in a bath of oil. After this step, it was time to go home and do my homework. Now that the majority of the shaping had been done and the first heat treatment was complete, I had to do some more heat treating at home. In my home oven, I baked the knife at 400 F for 4 hours, let the heat come down naturally, and then repeated the process. This further "tempered" the steel to make it stronger. After that, I sanded the steel to remove any discoloration. 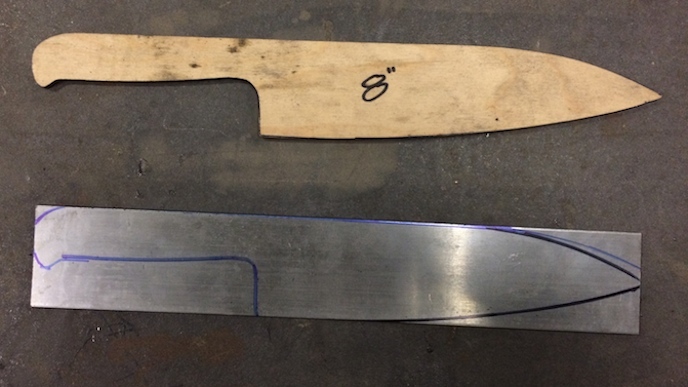 When I returned to the shop, I had to choose wooden slats or "scales" for my handle. After drilling through metal and wood pieces, it was time to secure the wood to the metal using epoxy and metal rivets. On my last day, it was time to grind down the wood handle to match the steel and then sand everything until it was smooth. To finish the process, I used the sanding belt to create a very sharp and lasting edge on my knife. This took several grits of sand paper and a final polish. I finished the knife by oiling the wood and metal and wrapping it an oiled cloth for storage. Needless to say, this class was totally rad and gave me a great appreciation for the common tools that chefs and home cooks use every day. Now off to the shop for round #2!!! 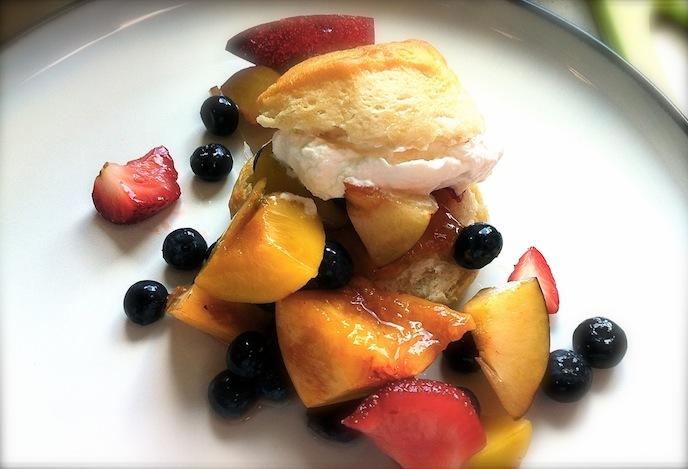 Every week I have the pleasure of teaching hands-on cooking classes in the DC area. I have taught over 30 classes and 800 students in a state-of-the-art cooking facility. These cooking classes are tons of fun and really fulfilling. Students roll in looking for a good time with friends, a fun date, and to expand their culinary horizons. My goal as a teacher is to walk my students through the recipes and teach them skills that will make them a success in the kitchen. We cover safety, sanitation, organization, knife skills, and food budgets, all while creating and eating three courses and sipping on some tasty beverages. The class starts out with an introduction to the theme and recipes, I throw in a couple of fun and goofy exercises to get everyone in the groove and then we are off. I always start the hands on portion of the class the same way. Before every step I say, "Watch what I do and then we will all do it together". The class recipes start off basic and build up to more challenging skills. The students that are patient and follow directions always come up successful. However, inevitably some students will skip ahead of the class and the results will be not so great. Then they look at me like I did something wrong. As a teacher this is incredibly frustrating and scary. We are just not reading books and looking at maps, we are working with fire, knives and yes, alcohol. This is a recipe for disaster if you ask me. The undercurrent of danger is a constant reminder that my skills as a teacher need to be on point. I remember being in kindergarten and the class was doing an art project. Something to do with cutting up egg cartons, pipe cleaners and cotton balls and the end product was a really cool craft that looked like a skiing snowman. It was the same basic learning concept, watch the teacher do the steps and the class will follow suit. I think I started daydreaming-cutting, pasting and coloring willy nilly. But, at the end of the class every kid had an awesome art project and I had a big mess of glue, glitter and cotton balls. Needless to say I was not happy but I learned a valuable lesson about learning. You have to stop, look and listen. What I have learned about teaching adults is that sometimes they just don't listen. Like teaching an old dog new tricks, it just doesn't happen. Like we teach children, as adults we need to stop, look and be an active listener. Understand how the information coming in relates to what you already know and how you can incorporate it to make you smarter, healthier and more loving. Keep an open mind about learning even if you think you already know the information. You just may learn something new. This weekend I had the pleasure to be a contestant in 2012 Great Baltimore Mac Off at this year's Hampdenfest in Hampden Baltimore. My goal was to offer a dish (the sample in the middle of the pic) that was classic with a unique twist that would be unmatched by other contestants. I also wanted a dish that could stand a two hour serving time without congealing into a hard rubbery, grainy mess. I chose to make a classic mac and cheese recipe starting out with rendering bacon and sautéing onions in the fat. Next I added flour to create a roux, which thickens the sauce and helps the cheese to melt with out separating. After cooking the roux for 5 minutes I slowly whisked in the cold milk to create a classis béchamel sauce. Next I added a pinch of nutmeg and brandy to flavor the sauce in the fondue style. 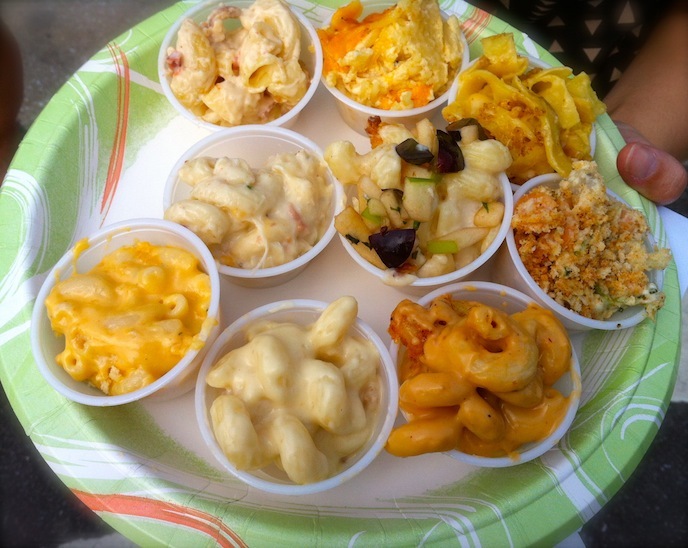 As for the cheese; most mac and cheese recipes are great, but turn out grainy and not creamy. This surely boils down to your choice of cheeses when creating the recipe. After my research and development I found that mixture of 4 cheese, Tullimook medium white cheddar, Sea Side sharp white cheddar, Pecorino Romano and Emi gruyere reserve provided me with a well balanced, flavorful, rich and creamy sauce. I slowly whisked in the cheese until smooth and then poured the sauce over par- cooked cavatelli pasta, which is like a larger twisty macaroni. I cooked the dish in the oven until golden brow fro about 30 minutes. The loose sauce had enough moisture to finish cooking the pasta and create a creamy sauce even after 2 hours of sevice. While that cooked I made a simple salad of chopped green apple, red grapes and fresh tarragon. This crunchy and colorful salad was the unique garnish for the top of my dish. After over 2 hours of tasting and judging the winners were announced. Much to my surprise I won the coveted "Peoples Choice Award" and was given an awesome gift basket with gifts from the shops on 36th st. aka "The Avenue". To top it off I got a super sweet trophy topped with a chef and covered in flames. Other winners included critics choice (amateur) Libby Franis Bauder and critics choice (professional) Trinity Fisher of Alchemy. This was my first public cooking competition I entered and could not be happier with the experience and results. Thank you to all of the organizers, volunteers and people that came out to participate and we will see you next year! Place the bacon in a pot over medium heat and cook until crisp then remove. Add the butter to the bacon fat, and cook the onion until soft. Stir in the flour and cook for 5 minutes on low heat. Slowly whisk in the milk then simmer on low heat for 15 minutes whisking constantly until thick. Stir in the brandy then whisk in the ¾ of the cheese and season with salt and pepper. Mix the cooked pasta and cheese sauce, place in a buttered baking dish, top with the rest of the cheese and bacon and cook at 350 F for 30 minutes or until golden brown. Garnish with sun chips and the apple and grape mixture. Mix all of the ingredients together in a bowl and serve as a garnish. This week ended with a real bang! I taught a full day of cooking lessons at my friend's school. My buddy Tito is an elementary school art teacher in Takoma Park Maryland. I taught lessons to his Kindergarten through fifth grade classes. The eager students learned about healthy eating, recycling and the fun of trying new foods. I am really glad I was able to use my past experience as the best substitute teacher in the world on this day, I really needed it. The interesting part about teaching kids is, you never know what they're going to do or say. They always have a comment or story about what you're teaching and sometimes something completely off subject. You never know where the lesson will take you; I guess thrive on this chaos and uncertainty because we had a blast. I had 2 lessons planned for the kids and both were very successful. The first lesson we did was a fruit cutting. We cut fruits like pineapples, grape fruits and kiwis which were the kid's favorite. Then we topped off our fruit salad with grapes and strawberries. The students scarfed down the fruit. Their favorite fruit was the fuzzy Australian kiwi fruit. We started cutting the fruit, Mr. Tito had the kids arrange the fruit scraps on to a large piece of paper to form a piece of recycled artwork. Then Mr. Tito started asking the kid's questions about colors, flavors and textures and then art concepts like space, aspect and form. My favorite part of the day was when the kids got to name the artwork. As a class we named the artwork "Fruit Fruity Tiki Tiki Jungle" and "Volcano". The second lesson I had planned was a vegetable stir fry. The kids got to watch as I cut up vegetables like onions, asparagus, sugar snap peas and purple cabbage. The big fun started when we learned about and chopped up a large celery root or "celeriac". While we were chopping the vegetables the kids learned about how to be safe around knives and fire and really loved to learn about the "Bear Claw" cutting technique! After we cut the food, I had some of the students come up and stir fry the vegetables. They got a big kick out of watching me sauté the ingredients in the air. I was very happy to see that most of the kids loved the colorful vegetable stir fry. One kid said he didn't like onions, I told her to take a bite and if she didn't like it, she would never have to eat another onion ever. She finally took a bite and quickly replied "I love Onions". I love teaching the younger generation about healthy eating and getting them to try new foods. A reply like that was a moment of real job satisfaction for me. The end of the school day came and I was pooped. Teaching kids all day is one of the hardest assignments I have ever had, I gave my hat off to my buddy Mr. Tito who does this everyday. Any person that says teachers have it easy is dead wrong and should spend a day in a grade school. Mr. Tito was very appreciative that I came in and so were the teachers who came by and got to taste some of our culinary delights. My job for you is to try a new vegetable and get a friend to try one too. You never know when you will find something you love! This week in the world of Chef Egg has been very exciting so far. Last Monday I taught an evening class on "The New Soups of Fall". This was a class of 25 very excited students ready to learn about the new school of fall soups. I have done a class like this over and over and I thought it would be a good idea to switch things up. Usually I do your basic autumn soups like butternut squash and pumpkin soups, sometimes I will get really crazy and throw an apple or cranberry in there.I decided to scratch all previous ideas and recipes, scour the new cooking magazines and show my students some new ways to think about fall soups. I picked three soups to showcase, a smoked turkey, black bean and pumpkin soup, an Eastern European lentil soup and a Native American toasted pecan soup. I thought these soups would make my class really interesting, and they did! The black bean and pumpkin soup was a mix of canned black beans, pumpkin and tomato.It was a pureed soup with full flavor, chunks of smoked turkey and had a splash of sherry vinegar and sherry wine to bring out the flavors. This was perfect served with warm bread and honey butter. The next soup was in honor of my Eastern European heritage. The Red Lentil soup was my first attempt at a lentil soup pand was surprisingly easy and flavorful. It was made with onions, garlic, red lentils, veggie stock and was topped with a dollop of non fat Greek yogurt and fresh thyme. This soup turned out rib sticking thick and was very fulfilling. This was an immediate crowd pleaser. Now, this last recipe was a gamble, the toasted pecan soup was new to me and my students. First I toasted off the pecans for a more intense flavor, and then I simmered them with chicken stock, onion, bay leaf, honey and a little chili powder. Once the pecans were soft I added some cream and pureed until smooth. It was flavored with a little salt and pepper and a healthy dose of maple syrup. Like I said, this recipe was a gamble that I think was successful. The pecan flavor and silky texture was very good. Though the flavor was a little too sweet for me, I think that the crowd appreciated the risk involved. These soups were a hit with my class of mostly females and a few young couples. Some of my students had never made a pot of soup in there life and were ready to get cooking after the class. Top tips for tasty soups! 1. Start Simple - I always tell people like this to start simple with a basic chicken soup. Throw a couple of chopped onions, celery, carrots, a bay leaf and a couple of chicken thighs ad legs into a pot, cover with water, let simmer for a couple of hours and see what goes down. When the meat falls off the bone, take the bones out and enjoy! It's that simple and very tasty. 2. Buy a good pot - Using a strong, heavy pot when you make soup will guarantee that your soup will cook evenly and not burn. I like to use a cast iron pot with an enamel coating. 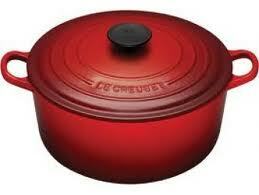 Pots like this can be found at Target, Walmart, online and at second hand stores for a good price. They cost around $50-$100 and will last a lifetime. 3. Sweet and sour power - Seasoning soups lightly with salt and pepper during the cooking process can boost flavor but can lead to super salty soups. A great way to add flavor to soups and stews is to add a little sweet and sour flavor. A dash of sugar and little vinegar at the end of cooking will really boost the flavor of your soup Autumn soups can be flavor boosted with apple cider vinegar and maple syrup, tomato based soups can use a drop of balsamic or sherry wine and a pinch of sugar. Lighter soups like a chicken or potato soup can be enriched with a little white wine vinegar and agave nectar. 4. Slow and low - Make sure your soups simmer on low heat and are stirred every so often. You do not want the soup to settle and burn on the bottom of the pot. Once the soup burns, it is very hard to remove that flavor. 5. Stock Up - When you make soups and stews, try to start off with homemade stocks. You can do this by covering celery, carrots, onions and chicken wings with cold water, simmer for at least 3 hours and then strain the solids. I like homemade stock because it has great flavor and doesn't have all of the salt that canned stocks and broths can have. 6. 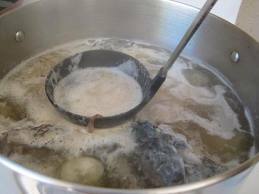 Lean and Clean – When you simmer soups or stocks, you will start to see foam and grease come to the surface. This surface scum is the impurities from the ingredients in your soup and is common when you are simmering fatty meats and vegetables for a long time. To remove the fat, all you have to do is take a spoon or ladle and carefully skim off the foam the gross stuff. 7. 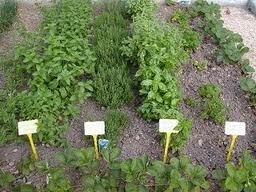 Green herbs - You can add that homemade flavor to your soups with dried herbs like bay leaf, thyme and parsley. I also like to add fresh herbs like celery greens, fresh parsley and dill to my chicken soup. This special ingredient makes chicken soup taste just like mom made it. My name is Chef Egg and I have dedicated my personal and professional life to teaching people of all ages and backgrounds how to cook. My mission is to inspire people to claim their culinary independence! To free the the people of the world from a frozen, boxed and fast food prison. When I am not working at my day job as a culinary instructor with Whole Foods Market, I cater small parties and private cooking events. I also cook for my friends and family and as you know, I produce the "Cooking with Egg" TV program. These activities take up most of my time and require a huge amount of heart, dedication and money. Like I said, this is my passion and life's mission. In this series of blog posts I am going to bring you along on my adventures at my day job and into new opportunities that come my way. During the day I have to go to job like everyone else. I am lucky to have a great career as a culinary instructor with Whole Foods Market in Silver Spring Maryland just outside of Washington DC. It's very challenging, crazy and most important, ever changing. I teach seasonal cooking lessons in the store and provide our local community with culinary outreach programs. This area is racially and economically and age diverse, has a great creative and up and coming food scene and is host to great non-profits, television production studios and radio stations. It's a ripe training ground for a teacher like me. During any given week I could be roaming the isles of my store helping customers, teaching elementary school kids how to make salads with vegetable they have grown. My favorite events are when I work with returning soldiers and veterans with disabilities how to prepare meals, making gazpacho or smoothies at the local retirement home or teaching single mothers how to use knives properly. I have taught lessons at Children National Medical Center, Walter Reed and Bethesda Naval Hospitals, The White House, NASA, Discovery headquarters, public and private schools, health fairs, local farmers markets, non profits and Whole Foods Markets in DC, Maryland and Baltimore. Needless to say I have the best job in the world, its rewarding and most important, it lets me get involved with the public and spread my knowledge. I am blessed to have found my calling and I can't wait to see what the future holds. So it was my birthday this weekend and I could not have asked for more. On Friday we had a house party where I served up my favorite food, tacos. For the occasion I made jerk chicken tacos with pineapple and jicama salsa and chimi churri chicken tacos with fresh salsa on corn tortillas. My lady made me a yellow cake topped with whipped cream, raspberries and black berries. To top it off late night style, my friend Stephen brought over a platter of treats. It was cool to watch my friends eat something new like pate and chicken liver spreads. On Saturday we woke up early and to see some friends an family in Philadelphia. We met up with my cousins and went to diner at Le Virtue where my buddy Joey is the chef. We had an unbelievable dinner based on the Abruzzi region of Italy. No Lasagne, and all you can eat bread sticks and salad here! We were treated to fresh unpasteurized cow and buffalo riccotta so rich and flavorful that it is not legal in this country and a platter of homemade cured meats. Next course was homemade pasta with lemon and zucchini, smoked sweet potato gnocchi with braised lamb and fresh ribbon pasta with duck. All of this before our main course of lamb with lentils and the most buttery tasting chicken I have ever had. We finished off the night with chocolate ravioli filled with sweet ricotta and hot chocolate sauce and piping hot fried donuts with coffee and vanilla gelato sauce. Then Chef Joey took us on a tour of the curing room with glasses full of Oban scotch, which is something I had never had and truly enjoyed. We woke up the next day and braved the pouring rain to check out the liberty bell and independence hall. After that, we stood outside in the rain to get a couple of Jim's famous cheese steaks on South St. This is my favorite spot for cheese steaks and I had to show my lady whats up. These cheese steaks are fantastic, with the fresh bread, salty cheese whiz and fried onions, you cant go wrong. The next day was my official birthday and since I scheduled myself off of work that day I was up for a day of relaxation. This actually turned into a full day filled with more history and more food. First up was a trip to Ft. McHenry in the southside of Baltimore, and ended with a full day of Baltimore's best eats. Raw oysters at Raleigh's in Fed Hill, Car Bombs at Mick O'sheas, up to the Brewers Art for a Resurrections and their signature chilli dog with chili, whiz, and fried sausage on a pretzel bun, topped with crushed Fritos. We topped the evening off with the square pizza at Joe Squared in Charles Village. I consider this one of the best Birthdays ever! When you have a great lady, friends, family and food, you cant go wrong. Now let me grab some Pepto and Tylenol and think about what to do next year. What is Chef Egg's Ovo-lution? Wassup, my name is Chef Egg and it is my mission to free everyone from a boxed, frozen, and fast food prison. Oh yes, the Ovolution will be televised my friends and the raw truth will be told! What is this "Ovo-lution" you speak of Chef Egg? Well, we live in a world where it seems as though it is not important that you actually know how to cook your own food. Just watch the TV – there's fast food and processed food on every channel and the obesity epidemic is at an all time high. Funding for cooking, vocational, health and physical education is being cut; school kids don't have breakfast or lunch and their parents don't know how to feed them a proper dinner because they were never taught how to cook! This is a rotten cycle and I intend to stop it. This is the Ovolution, and it will be televised! Just step into my kitchen. But this isn't your everyday ordinary kitchen, oh no. This is a kitchen that has come to life to school future cooks of all ages. With a little help from my friends, I'm going to teach you how to really get cooking! I'm not just going to show you how to follow a recipe, I and here to give you the tools you need to claim your culinary independence!!! We are going to talk about sizzling recipes, easy techniques and meet some cool new foods. Always remember, the OVO-LUTION WILL BE TELEVISED!! !